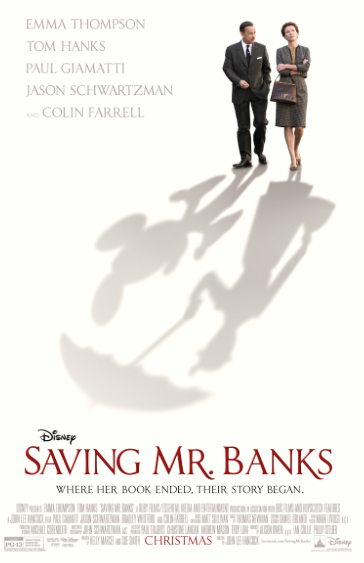 Those winds in the east (or maybe in this case the west 😉 ) bring us the latest from Walt Disney Studios, ‘Saving Mr. Banks’, opening in theaters nationwide today, December 20th, 2013. I’ve been excited for this movie since I first heard about it in July! 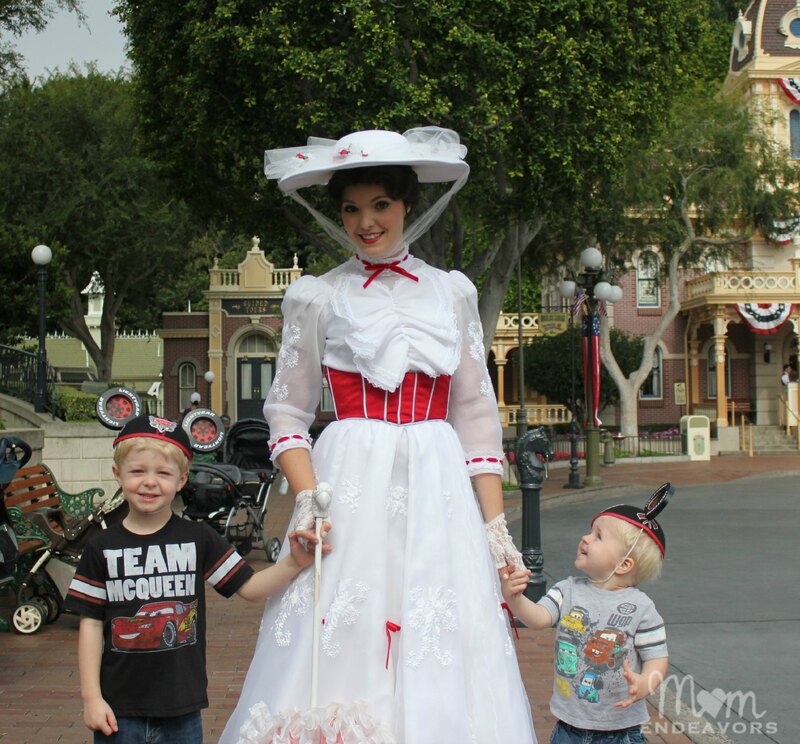 In that post 5 months ago, I shared some adorable photos & videos explaining why Mary Poppins holds a little extra special place in my heart. When Walt Disney’s daugh­ters begged him to make a movie of their favorite book, P.L. Tra­vers’ “Mary Pop­pins,” he made them a promise—one that he didn’t real­ize would take 20 years to keep. In his quest to obtain the rights, Walt comes up against a cur­mud­geonly, uncom­pro­mis­ing writer who has absolutely no inten­tion of let­ting her beloved mag­i­cal nanny get mauled by the Hol­ly­wood machine. But, as the books stop sell­ing and money grows short, Tra­vers reluc­tantly agrees to go to Los Ange­les to hear Disney’s plans for the adaptation. For those two short weeks in 1961, Walt Dis­ney pulls out all the stops. Armed with imag­i­na­tive sto­ry­boards and chirpy songs from the tal­ented Sher­man broth­ers, Walt launches an all-out onslaught on P.L. Tra­vers, but the prickly author doesn’t budge. He soon begins to watch help­lessly as Tra­vers becomes increas­ingly immov­able and the rights begin to move fur­ther away from his grasp. It is only when he reaches into his own child­hood that Walt dis­cov­ers the truth about the ghosts that haunt her, and together they set Mary Pop­pins free to ulti­mately make one of the most endear­ing films in cin­e­matic history. While the plot centers around those two weeks in 1961 and Disney trying to obtain the rights to “Mary Poppins”, really about half the film takes us to 1906 Australia. In a series of repeated flashbacks throughout the movie, we get the very personal details of P.L. Travers childhood. The young Travers idolizes her father (played by Collin Farrell), who is a dreamer and quite charming. Sadly though, between her overwhelmed mother and her father’s alcoholism, her childhood is less than dreamy. So, we see where the story of “Mary Poppins” really originated and all the old emotional wounds & baggage that has shaped Travers into the stiff curmudgeon she is as an adult. We loved this movie! Even though it’s a film where everyone knows how it ends (since “Mary Poppins” went on to win five awards of its 13 Acad­emy Award® nom­i­na­tions), there are many surprises. 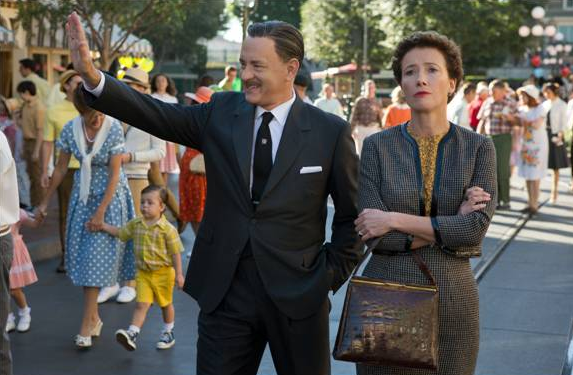 This is the first film to depict the iconic entre­pre­neur Walt Disney, in which Tom Hanks does a great job with the role. However, the HUGE standout is Emma Thompson. She plays the uncompromising, stiff author so well! Truly, much of her demeanor seems completely extreme and unbelievable – like her demand that the color red cannot be used in the film. And then, the credits roll at the end where you get to hear actual audiotape recordings of the real Travers during the sessions. Wow! Like many I assume, I find myself absolutely shocked by her and found her so unlikable. Yet, as the film goes on, I ended up feeling so sorry for her. In many ways, I think the film shows what a profound effect your parents and your childhood can have on your life (for better or worse). While the flashback scenes are absolutely vital to the whole backstory (and Collin Farrell is outstanding), many of those scenes were hard to watch. Heartbreaking really. And, those are the scenes that make this movie NOT for kids! This is not a sugar-coated remake of Mary Poppins. While there are some absolutely charming, funny, and very Disney-esque scenes, there are almost as many sad, emotional, and disturbing moments of Travers’ past with an alcoholic father that earns the film a PG-13 rating. For older kids (I’d say teenagers for sure) and adults though, this is an absolutely fabulous movie! It’s somehow a mix of heartbreaking & heartwarming, funny and sad all at the same time, in a way that definitely works well (dare I say, “practically perfect”?! 😉 ). And, if you’re a Disney fan, you’ll LOVE the Disney nostalgia — seeing Walt up on the big screen, the behind-the-scenes making of the film, and the glimpses at what 1960s Hollywood, Walt Disney Studios, and Disneyland were like! Are YOU excited for this new Dis­ney movie? Dis­clo­sure: We saw this movie at a free press screen­ing at the invi­ta­tion of Dis­ney. All opin­ions and expe­ri­ences are 100% my own and your opin­ion of the movie may dif­fer from mine.